HomeBlogPoint/Counterpoint: Does BC’s Season Look Better or Worse After March? I love the transitive property. If a = b and b = c, then a = c. Used incorrectly, it can distort reality, reframe issues entirely, and make fans of struggling teams feel slightly better about their losing seasons. Example: Boston College men’s basketball almost beat North Carolina. North Carolina won the national championship. Therefore, BC almost won the national championship. Okay, so maybe it’s not a foolproof method of drawing conclusions based on relationships. But this year’s March Madness did make me feel better about the Eagles’ 2016-17 season, and even eased some of my concerns about the future of the program. The tournament validated the talent of the Tar Heels—the only perennial powerhouse that doesn’t rely on one-and-done recruits—a team, in fact, that BC almost upset back in January. At times, it was magical. With the Eagles facing a double-digit deficit midway through the first half, freshman Ky Bowman single-handedly sparked a 10-0 run that tied the game at 27-27. When Bowman and his signature red hair went to the bench for a breather, his partner in crime, Jerome Robinson, stepped up. The 6-foot-5 sophomore poured in 13 second-half points to keep the game close while UNC’s frontcourt had a field day in the paint. BC’s undersized forwards ultimately couldn’t contain the Tar Heels’ big men, as Justin Jackson, Kennedy Meeks, and Isaiah Hicks combined for 56 points en route to a 90-82 win. But the resounding story of that chilly Saturday afternoon was the Eagles’ young backcourt of Bowman and Robinson. The North Carolina natives left an impression on head coach Roy Williams, who couldn’t stop raving about their performances and marvelled at how they slipped under his radar as recruits. Bowman, who previously committed to UNC for football, dropped 33 points—his third 30-plus-point game of the year—to complement Robinson’s 18. And they did it all against defenders like Joel Berry II and Justin Jackson, who were celebrated for their lockdown perimeter defense in Monday’s national title game. Pessimists might point out that the Eli Carter-led Eagles nearly took down the Tar Heels in 2015-16, narrowly falling, 68-65. But that team of two seasons ago never won a single ACC game. Well, despite the fact that both UNC squads were ranked No. 9 and advanced to the national championship game, those two matchups were completely different. In 2016, the Tar Heels were in the midst of a slump, prompting Williams to send a message to the team by benching Meeks and Jackson to start the game. While UNC didn’t shoot terribly percentage-wise from the field (31 percent from 3-point range, 51 percent overall), the team played like trash. Williams was so frustrated with the effort that he collapsed in the second half due to a spell of benign positional vertigo. It took some hero ball from Jackson and Marcus Paige down the stretch to eke out a slim victory over a really, really bad BC lineup that was without Robinson. In 2017, the Tar Heels actually played like the ninth-best team in the nation. UNC boasted four different scorers in double digits and shot 43 percent from behind the arc. The Heels hit hard and, each time, the Eagles punched back. They showed that they can compete at a high level when they’re clicking, and watching UNC cut down the nets on Monday night only proved that. Some say that the Tar Heels’ tournament run overshadowed the fact that the ACC, as a whole, significantly underperformed in March. Nine teams from the conference earned bids, yet only one remained in the Sweet 16. But I argue that the ACC’s poor tournament is a product of unlucky seeding and poor matchups, not a sign that the conference was deceivingly mediocre during the regular season. No. 9 Virginia Tech was edged by an underrated Wisconsin team that went on to knock off No. 1 Villanova. Duke was ousted by South Carolina, which later became the surprise of the tournament when it reached its first-ever Final Four. Louisville was upset by Michigan, a squad that looked like a “team of destiny” for the first two rounds of play. Notre Dame ran up against a tough West Virginia lineup that showed it could beat anyone in the country with its lethal full-court press. The list goes on. You can’t just ignore the regular season when assessing the strength of the ACC this year. The conference was still the best in terms of RPI and success in nonconference play. The league finished with a winning record against every conference in the country except, oddly, the Big East. Toward the bottom, it had more depth than any other conference, and at the top, it lay claim to the eventual national champion. Watching an ACC team prevail in March Madness—let alone a team like UNC, which the Eagles went toe-to-toe with just a few months ago—should have made every BC fan feel a little more optimistic about the future of the program. At one point this year, Boston College men’s basketball was ahead of Duke, Virginia, Louisville, and North Carolina in the ACC standings. Granted, it was one game into conference play and one day into the new year. But even as the Eagles would soon revert back to their home—the cellar of the league—fans were hopeful. After all, this was the ACC—the best conference in all of college basketball. Or so they thought. I don’t blame them. The conference was coming off a record-breaking March Madness. It tallied more tournament wins than any team in prior history. Not to mention that six ACC teams made it to the Sweet 16, and four went on to the Elite Eight. More than a week remained before the national final, and the conference was guaranteed a chance to take home the championship. Before this season started, Duke was voted as the preseason favorite to win the conference. Teams like Virginia and Syracuse rounded out the top-five. And North Carolina State was supposed to flirt with the best, as it was slotted to finish sixth in the league. In actuality, the Blue Devils wouldn’t even crack the top-five. At times, NC State looked the worst team in the conference. And it was the Notre Dames and Florida States that contended for the ACC’s regular season title. While some were skeptical of the underwhelming play of the conference’s powerhouses, many chose to ignore it. Instead, they adopted a philosophy defending the fluctuation in the standings. People theorized that, since the ACC was so good, any team could beat anyone on any day. 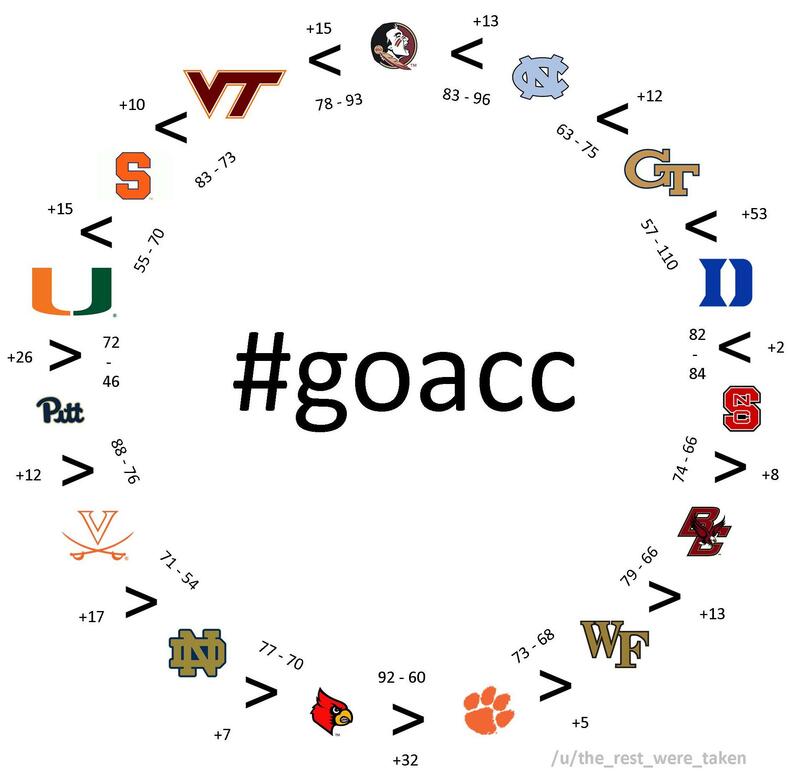 Some, myself included, even resorted to Reddit’s transitive circle—a diagram that shows how every team in the ACC has indirectly defeated the remaining 14. Besides, the AP’s Top-25 poll reflected that the conference was indeed the best in the nation. Despite having more losses than the teams surrounding them in the rankings, UNC, Duke, and Louisville found their way into the top-10 by season’s end. Combined, those three teams totaled 23 losses. The other seven teams in the top-10? Just 26. Heck, Virginia was still in the poll’s rankings with 10 losses and a meager ACC Tournament performance. When it came to March, reality began to settle in. The ACC sent nine teams to the NCAA Tournament, but only one made it to the Sweet 16: UNC. Sure, the Tar Heels would go on to win the National Championship, but that by no means affirmed the conference’s superiority. By that logic, last year’s Big East was unrivaled and the American Athletic Conference of 2014 was greater than every Power Five conference. The ACC’s shortcomings were exposed in the first two rounds of tournament play. A potentially revitalized Duke fell to South Carolina. Louisville and Notre Dame didn’t fare much better. And groups like Miami and Virginia Tech—the middle-of-the-pack teams in the conference—struggled to upend the allegedly weak Big Ten. Including Wake Forest’s loss in the First Four, the ACC was 7-8 going into the Sweet 16. Even with the most teams in the field, it failed to pick up as many wins as the Pac-12, Big 12, and Big Ten. To make matters worse, it was the only conference out of the Power Five and Big East to post a sub-.500 record through the second round of the tournament. BC’s postseason consisted of a day game in the ACC Tournament. But that doesn’t mean the program wasn’t affected by what transpired in the latter portion of March. Every time an ACC team was eliminated, the Eagles season looked that much worse. Over the past two years, BC has won just as many ACC games. But for the most part, head coach Jim Christian has been cut some slack. He entered Chestnut Hill with one of the toughest jobs: rebuilding a David among a plethora of Goliaths. Yet, now that we know that the ACC isn’t as almighty as originally advertised, Christian and the Eagles have some explaining to do. Maybe all of the conference’s upsets this year were a testament to the fact that the majority of the teams in the ACC are mediocre. And if that’s the case, there is no reason why BC shouldn’t have been in the same conversation with the bulk of the conference. Look at Wake Forest. Coming off of a dismal 2-16 conference record in 2016, the Demon Deacons worked their way back to the NCAA Tournament for the first time in seven years. Head coach Danny Manning was presented with the same problem that Christian faced—the challenge of creating a cohesive group of guys that can compete with the teams driven by marquee recruits. Both Manning and Christian were hired in 2014. But, while the Eagles still dwell in the basement of the ACC, Wake Forest has already moved out. For BC, the 2016-17 season was a sign of progress. The Eagles snapped a 666-day ACC losing streak, established the fifth-highest scoring backcourt in the Power Five, and, most importantly, found their identity. Hey, Christian’s group even gave the eventual national champions a scare. But there is no time for moral victories. Next year, Jerome Robinson will be a junior. And with the way Ky Bowman is playing, the All-ACC Freshman could very well leave early for the NBA. March uncovered the vulnerability of the ACC. The time is now for Christian to take advantage of it.